While I was grocery shopping last week, a woman approached me. “I remember you,” I said. She asked if I remembered her son. I did. Big kid. Transguy with a great sense of humor. When I asked who had a purse story, he was the first to share. Turns out he had two purse stories. She told me he was doing well. Graduating from high school next month. Just got a new job. Forming a support group for older trans teens and young adults. “He still talks about you,” she said. And I was reminded about how important it is that we keep telling our stories. No matter how much the world has changed. Or how busy we are. Or how tired of our own story we might be. At dinner last week, one of the kids asks me if I have more flannel shirts like the one I had given him to wear in his school’s production of Annie Get Your Gun last year. “I don’t know. Why?” I ask. “Is she a lesbian?” I ask. Underground supplier of flannel, I say to myself. I sit a little taller in my chair. I feel a little bit like a hero. Passing on my used flannel shirts to kids who need them the most. The intersecting horizontal and vertical stripes forming hundreds of tiny crosses as they cover a new body. One of our kids was in a serious bicycle crash almost two weeks ago. He spent a week in the hospital. W stayed with him around the clock. “You make him feel safe,” I told her. He was home for a few days but had a setback and is back in the hospital for at least another week. W is by his side. Once again, I am making a daily trek to the hospital. W sends me a list of what to bring that day: nail clippers, a travel-size bottle of shampoo from the top of her dresser, Advil. I usually visit late afternoon and stay until it starts to get dark outside. I run out for whatever the kid wants. It is always sweet tea and something else. Today it was a single glazed donut. I tell him I am going to buy him a Smashburger with cheese and bacon and a Nutter Butter milkshake when he feels better. W and I sit on the couch in his room. She gives me the update. “What’s new with you?” she asks. I tell her what’s happening at home. We eat take-out for dinner. We watch silly videos about Prince beating Jimmy Fallon at ping pong and cats doing silly cat things. We stare at our phones. Sometimes I bring the newspaper or a magazine to read. But mostly we sit without speaking. I might squeeze her hand or rub her back to remind her I am here. That I will always be here, especially in times like these. And I remember how lucky I am to have W by my side as life storms by. Our youngest has a role in this year’s high school musical. They are performing “Annie Get Your Gun” this spring. Yesterday afternoon, I took him to a couple of local thrift stores to look for a pair of cowboy boots. We found a pair that fit on sale for $14. Yeehaw! I am letting him borrow a western-styled flannel shirt to wear in the play. “Do you have a shirt my friend Sandy can borrow?” he asks. As I am sorting through a pile of flannel looking for a shirt for his friend, I am struck by the volume of my collection. Sometimes we take for granted all that we have. The roof over our heads, our overstocked pantry and freezer. The ability to buy a new shirt whenever and just because and flannel! Even though we ended up going the thrift store route for the cowboy boots, we have the means to buy our kids new boots for a play, a suit jacket for chorus, tools for vo-tech. “If any other kids need flannel shirts, let me know,” I tell him. “Ok, I’ll tell the play director to let everyone know,” he says. When W comes home that night we laugh. We can’t wait to hear what he told the director of the play. So stereotypical but so true. Flannel, it’s for butches. It’s for young thespians and gunslingers and lumberjacks. Everyone, really. So, yeah, it’s good to be butch. It’s good to share. And it’s good to remember to be grateful for all that we have. A few weeks before Christmas, I saw three blue jays in our backyard. Three blue jays lined up on a white picket fence, their painted crowns poking into the morning sky. I knew there was some meaning in my sighting. I went to my computer and looked up the blue jay as an animal totem. I try to remember to be a partner and a parent and not a bully. Sometimes the line is blurred, especially because I am a person who admires strength as both a physical and mental quality. I watched the oldest child do his second load of laundry. Ever. I wanted to yell at him to go through his pockets first. This is the kid who carries around lighters and pocket knives, paperclips and disassembled pen parts, and other shiny detritus he finds on the ground. But then I see him sifting through his blue jean pockets without my nagging. The middle child always tells me what I want to hear. He has figured out that this is one way to get me off his back. “Did you bring your dishes downstairs?” I ask. I find his dirty dishes in his dresser drawer. “You know that drawer doesn’t actually wash the dishes,” I say. “Oh, I didn’t know,” he replies. Laughter is a better sound than yelling. After all, they are just dishes. Discs made out of clay. We are made out of clay, too. We can cut each other with our words. Or build each other up so that we are so tall our heads poke into the clouds. I saw another blue jay on Christmas Eve. On the day after Christmas, I saw a red fox. “Since the fox lives ‘between times’ — on the edge of land, visible as dusk and dawn, and can guide the way to the Faerie Realm. A fox can teach you to control your aura so that you can be more in harmony with others and the world. If you have a fox totem, learning to be invisible is very important in your life. Imagine yourself blending in with your surroundings, becoming part of the background. Be very still and quiet. Through practice you can be unnoticed even at a party or in a crowd. What about you? What are your animal totems? The information on each animal totem comes from Lin’s Domain. One reason that I get sad sometimes is because my son is 14. Fourteen and too big and grown for a mother, or at least that’s what he tells me these days. I see him once a week if I’m lucky. “Mom, can we skip this week? I’m really busy,” he informs me. I usually say it’s okay because I don’t want to ruffle his feathers anymore than they already are. These days he’s like a peacock having a really bad hair day. I get him every other weekend, but that too is subject to the whims of a 14-year-old boy. When he was 13, he went to live with his father. I agreed to this new arrangement, knowing that if I held onto him too hard I would lose him for good. He came home this weekend. 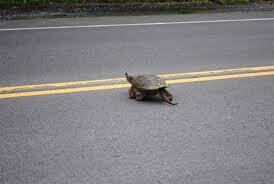 One of the highlights occurred when we spotted a turtle in the middle of the road. It had been a long time since I had seen him this excited. I pulled to the side of the road and put on my hazards. “Be careful crossing the street,” I said, unable to silence my inner mother. He was. He was 14 after all. He picked up the turtle by the shell, carried it back to the car and placed it inside an orange bucket. I have been carrying this just-in-case bucket in the trunk of my car ever since he was a little boy. There have always been frogs and toads and turtles and other creatures that have unexpectantly come into his life. The bucket has come in handy more times than I can enumerate. I believe in animal totems among other things and tried to explain to my son how the turtle carried a message for him, for us. “Mom, we’ve lost you,” he said in a sarcastic voice that only a 14-year-old can master. I knew not to protest. Not to try to explain the turtle sighting anymore. But I also knew in my heart that the turtle was my sign to proceed cautiously and slowly and to have faith that in the end both of us would get to where we need to go. From my writer’s group session today. Prompt: One reason that I get sad sometimes is because ________________.